Your new company website is smart, functional and pretty-darn beautiful. You invested time and money to make it perfect for users, but not without considering search engines as well. After all, having a gorgeous site only matters if people find it, and that means making Google happy. If you follow the rules and optimize your pages according to it’s latest algorithm, you will have a better chance of showing higher in a search engine results page (SERP) when potential customers search for the products or services your business provides. 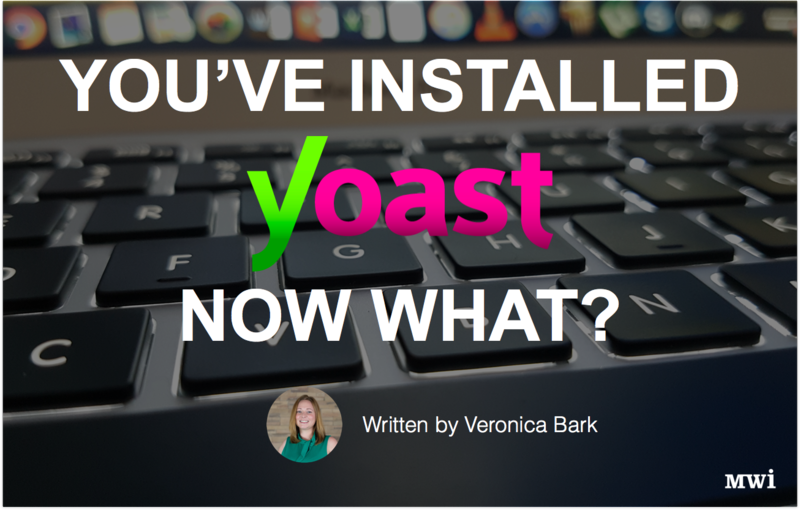 You know all of this, which is why you installed Yoast SEO on your WordPress site (of course you used WordPress). Most SEOs recommend installing the Yoast plugin. It’s free and offers a host of features that allow you to quickly optimize your pages for search engines, while providing feedback on the overall readability of a page. 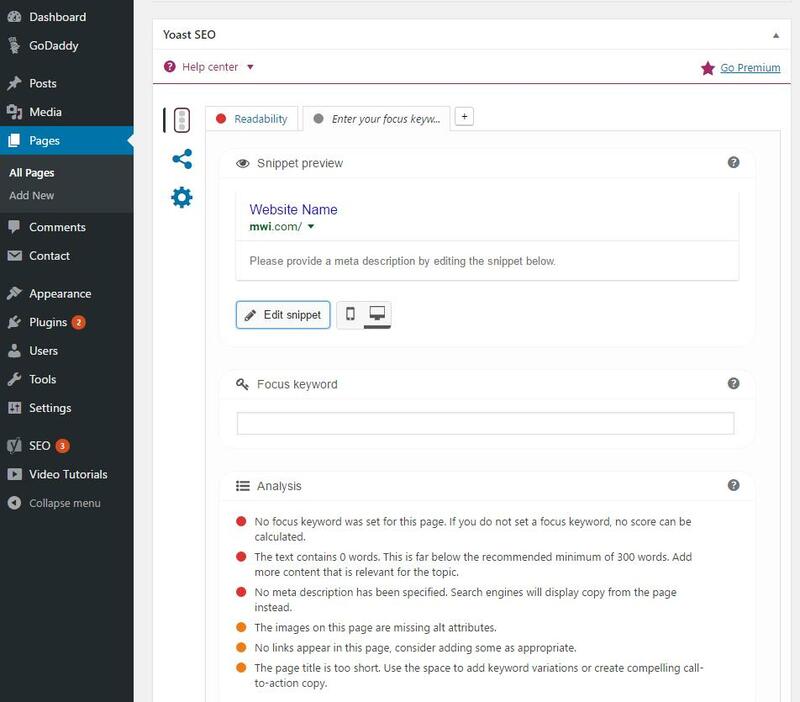 You can easily change page titles and meta descriptions, manage sitemaps, set keywords, and examine the strength of a page’s SEO value with one powerhouse plugin. If you don’t have an SEO expert on staff, Yoast is the easiest way to implement some very basic search engine optimization techniques for your website. So, once you download and install Yoast, you can just sit back and watch your rankings move up the SERPs, right? Wrong. Simply adding the plugin to your site will not provide any benefit. You have to know how to set it up and use it if you want to get the most out of it. Fortunately, it is a fairly simple plugin to work with. The WordPress interface is user-friendly and the plugin intuitively fits into the dashboard. When you are ready to put Yoast to work, begin with the global settings. The items on the left menu and tabs within the SEO sections will guide you through each step of accomplishing these tasks. Updating the global settings for the website are only part of the capabilities of the Yoast SEO plugin. You can incorporate optimizations within each page as well. Once you click into a page, scroll below the page text. 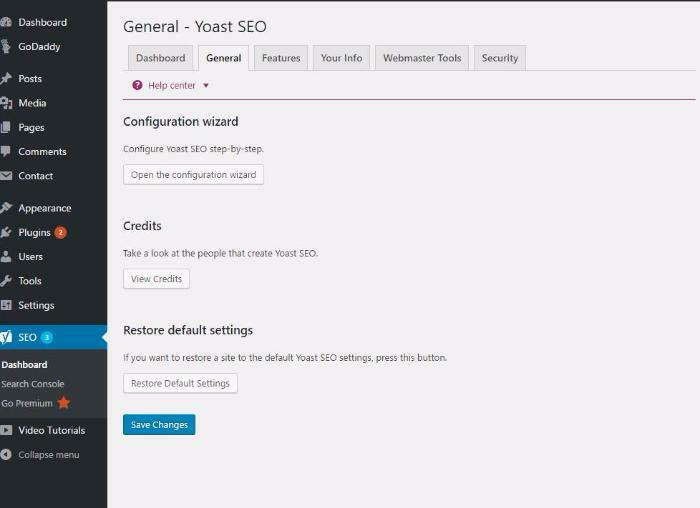 You will see a Yoast area with a content optimization section, a social section and an advanced-settings section. The optimization information should be filled in for every page on the website. This is where you add your meta data that tells the search engine crawlers what the page is about. You can also add your focus keyword for the page in this area. Keep in mind this field is not critical, as search engines are more concerned with the quality of the content on the page, rather than how many times and where the target keyword appears. But feel free to fill out that field for your own reference. What is most important in this section is filling in the page title and meta description for each page. To do so, click on the “Edit snippet” button below the preview. You are given the option to edit the slug, SEO title and meta description. As you make changes or add text, it will update in the snippet preview at the top of the section. Colored bars assist you as you type, letting you know when your title and description are the appropriate length to fit in individual search engine results. Below the snippet editor, you will see a brief analysis of your optimizations from Yoast. This gives you feedback on use of your keyword, the length of your content, image alt text, the URL slug, and whether you should add links to the copy. Your SEO score is noted by colored circles: green = good; orange = needs improvement; and red = you might as well just leave it blank because you would probably get the same result. Obviously, you are looking to see mostly greens, but a few oranges are usually OK.
Social Settings are also editable with the Yoast plugin. You can adjust the way the page link appears when shared on Facebook by giving it a unique title, description and image. Whatever you put in the boxes in this section will be what your followers see in the post when you, or anyone, shares the link on the social network. 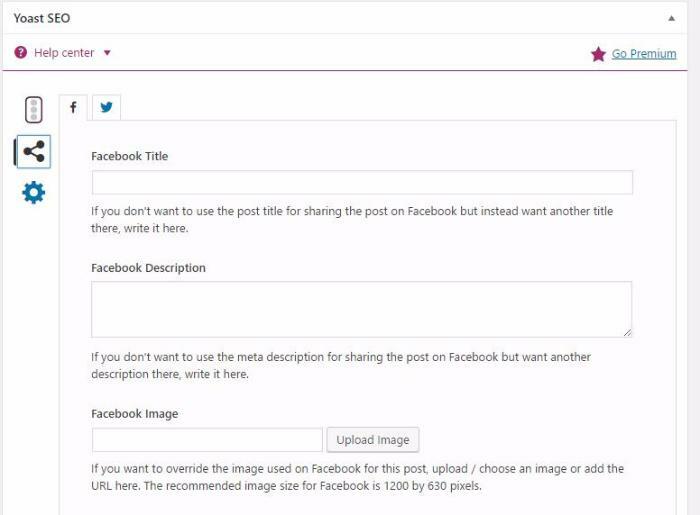 If you don’t specify any of these components, your posts will have the page’s H1, meta description and whichever image Facebook chooses to show instead. 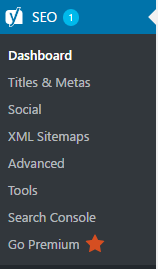 The last piece you can change in the plugin’s page area is the advanced settings. For those who are not SEOs or developers, this section may not make much sense and likely won’t be touched. 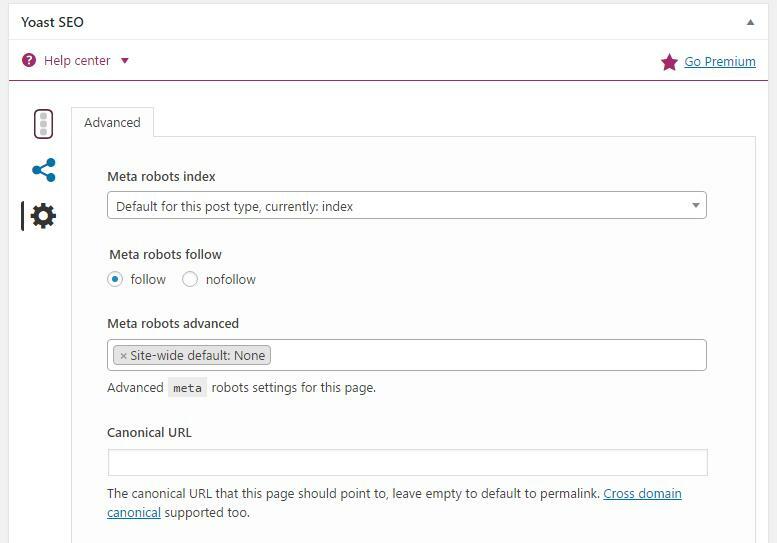 If you know a thing or two about the technical side of SEO, this section allows you to change the configurations of the robots meta and set the page as canonical, which may be necessary in the case of duplicate content. In most cases, you will probably leave the default settings here. If you aren’t sure, an SEO can help you. After Yoast has been set up, make sure you are frequently checking your analytics to see which pages could use improvement. Sometimes changing the meta data or refocusing the content to the keyword can give your rankings a little bump. If you want to make life even easier on yourself, MWI offers search marketing services to help you track your progress and maintain your website for optimal ongoing SEO. But wait, there’s so much more! It is important to note that Yoast primarily deals with “on-page” ranking factors. There are over 200 known factors that influence Google’s ranking algorithm, which is what decides where your website falls in the SERPs. On-page optimization is only part of the bigger picture. You need great content. You need to ensure that your great content can be effectively crawled by search engines and that it is not duplicated across multiple pages. You need to build domain authority through relevant backlinks. You need to ensure that your website is mobile-friendly. These are only a few of the complex factors that search engines consider when determining the relevancy of your website as it relates to search engine queries. If you have questions or are ready to grow your online business, contact MWI today to discuss your needs. Veronica has nearly 10 years of experience developing complex marketing strategies that help her deliver positive, ROI-driven results. Her digital marketing wheelhouse spans the areas of search marketing, content planning, data analysis and website forensics. By working closely with MWI’s social, content and development teams, she is able to create integrated SEO/content plans that drive traffic, engage users, and increase conversions. When she’s not busy reading up on the latest digital marketing trends, Veronica enjoys rock collecting, reading, and writing poetry.